Postman David Carey alerted 9-1-1 to a structure fire at 111 Our Dream Lane Tuesday morning 31-May at 10:44. While delivering mail, Mr. Carey noticed smoke and flames coming from the rear of the residence. Engine 19 arrived a short time later to find moderate smoke conditions and flames visible from rear and roof of the singlewide mobile home. Click here for additional information. A two vehicle high speed MVC on Cottageville Highway (US Hwy 17-A) left four people injured, two critically Sunday afternoon, 29-May. The accident occurred at 16:57 at the intersection of Merrick Drive. A southbound Toyota reportedly suffered a blowout causing the vehicle to veer into the northbound lane striking a mini-van head-on. 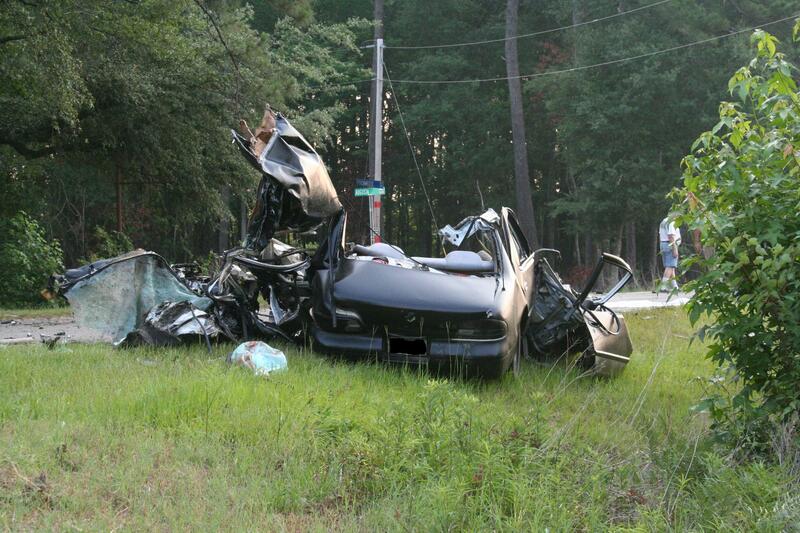 Two occupants of the Toyota received critical multi-trauma injuries, with the driver being trapped in the wreckage. Click here for more information. 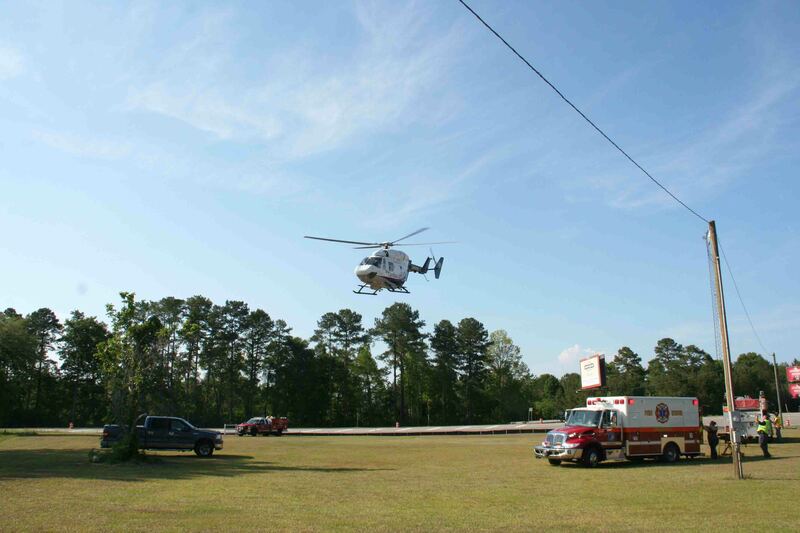 A single vehicle accident sent one man to the Trauma Center at MUSC Sunday afternoon 29-May at 16:23. A motorcycle traveling on ACE Basin Parkway (US Hwy. 17) collided with a concrete road divider near the intersection of Green Pond Hwy (SC Hwy 303) causing the driver to lose control of the Harley Davidson motorcycle. Click here for additional information. 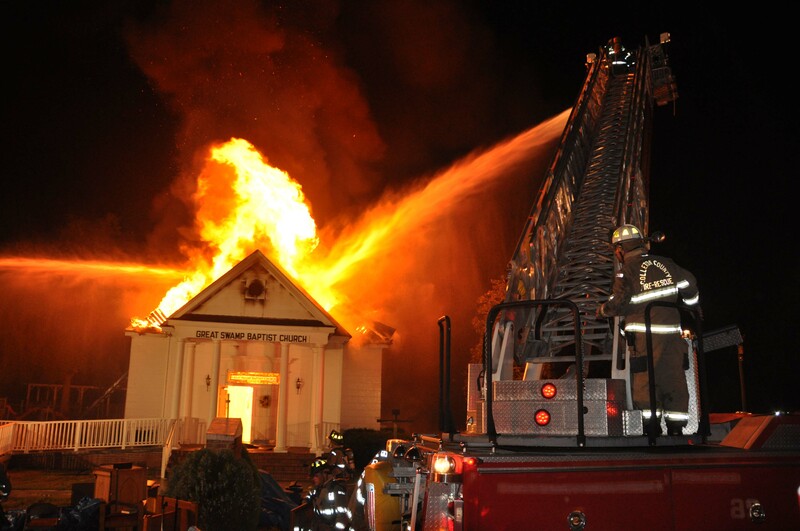 A change in routine, quick thinking on the part of parishioners and early notification contributing to saving the Peniel United Methodist Church Sunday morning 29-May. 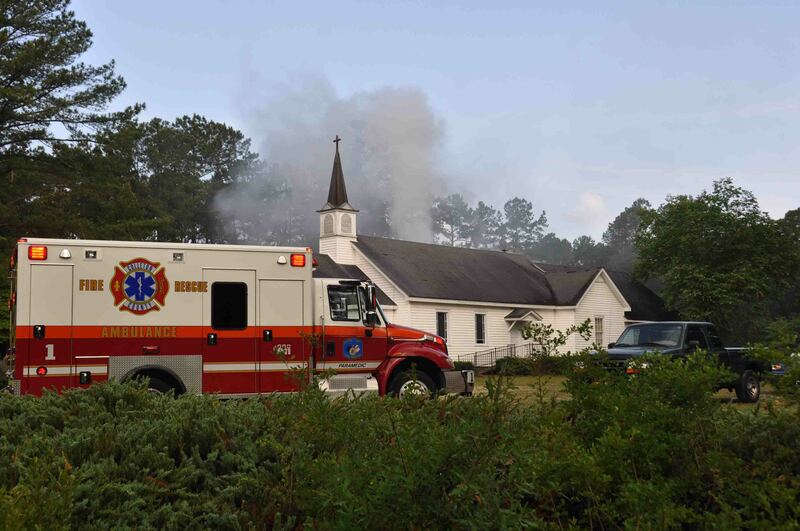 At 08:48 Fire-Rescue was notified of a fire in the church, located at 1590 Peniel Road at the intersection of Great Swamp Road. Engine 1, Medic 1 and Tender 1 arrived to find heavy smoke conditions....click here for additional information. 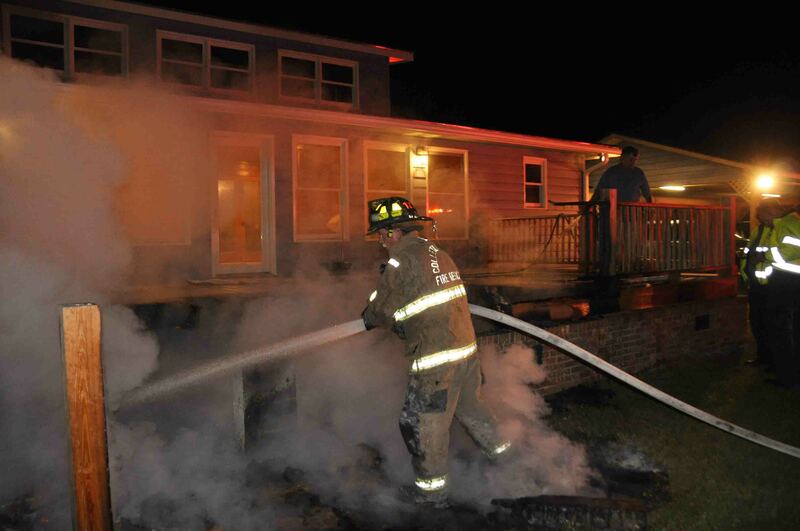 For the second time in five days, firefighters saved the singlewide mobile home at 205 Godwin Street. Last Friday, the structure received exterior damage when a warehouse next door caught fire. At 15:50, Wednesday 25-May, 9-1-1 was alerted to a fire in a bedroom at this address. The occupants discovered the fire and closed the bedroom door, slowing the progress of the flames through the rest of the building. Click here for more information. A two vehicle MVC has left one person dead and another person injured. 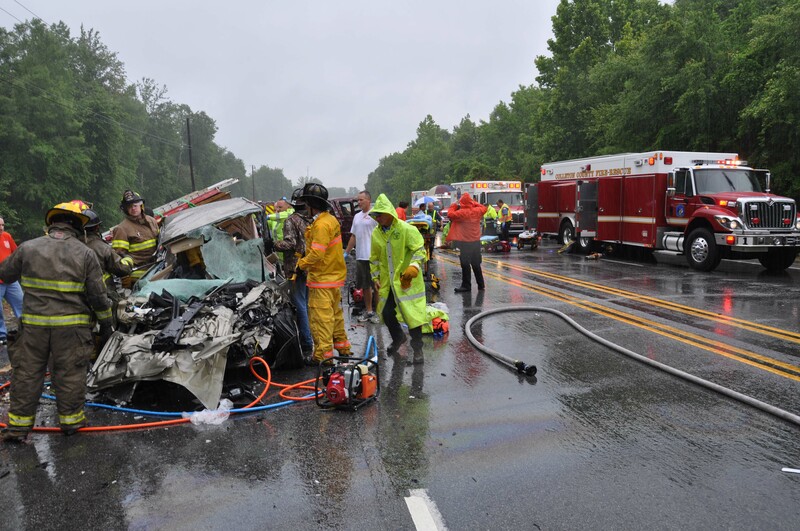 Fire-Rescue responded to the fatal collision in the 21000 block of Augusta Hwy (SC Hwy 61) at Pumpkin Girl Lane Wednesday morning 25-May at 06:22. This is the second fatal MVC on the same stretch of highway in the last week. The MVC involved a small passenger car and a tractor trailer transporting boat hulls. Click here for additional information. A two vehicle MVC has left one man dead and a woman with minor injuries. 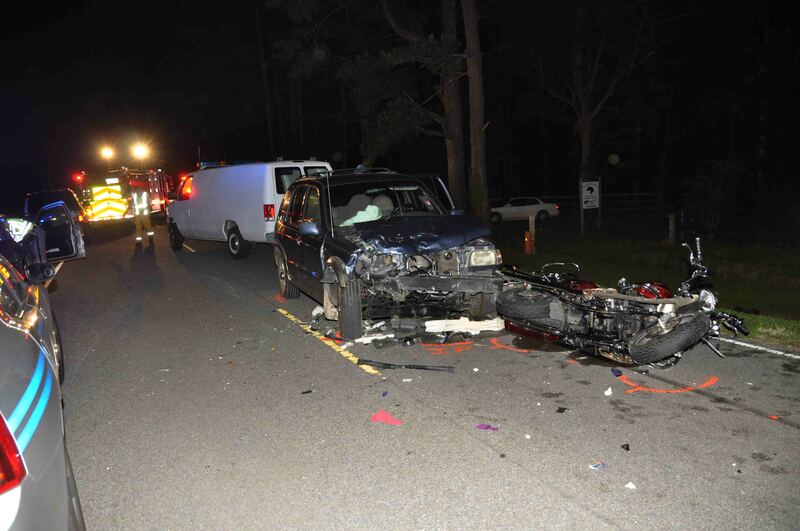 Fire-Rescue responded to the fatal collision in the 26300 block of Augusta Highway (SC Hwy 61) west of Pearce Road Friday evening 20-May at 21:19. Apparently a west bound 2001 KIA Sportage was traveling in the east bound lane when is struck an east bound Harley Davidson motorcycle head-on. Click here for additional information. A structure fire in a small warehouse resulted in substantial damage to the building Friday afternoon 20-May. At 19:46, Firefighters were originally dispatched to a shed fire at 205 Godwin Street. Car 12 arrived to find a 25x60 foot wooden warehouse with flames venting through the roof. 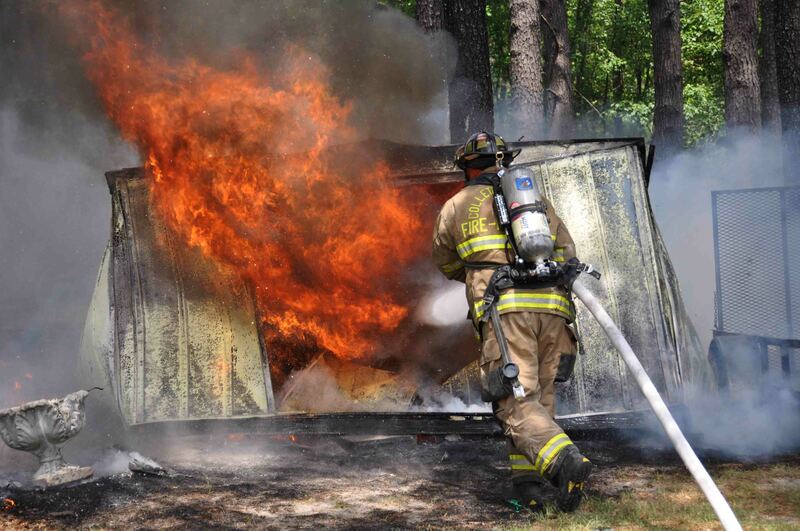 An open storage area on the rear of the building as well as two outbuildings were fully involved... click here for additional information. 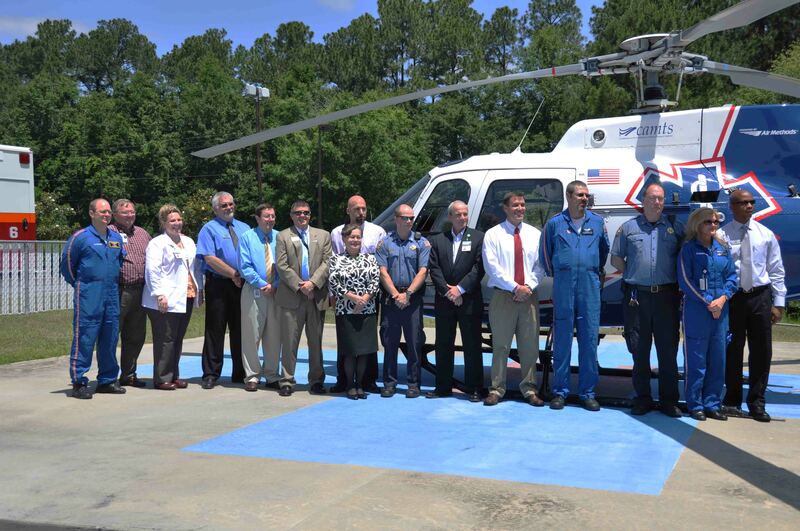 Representatives from AirMethods, the parent company of Lifenet SC, attended the EMS Appreciation Luncheon sponsored by Colleton Medical Center Wednesday 18-May. 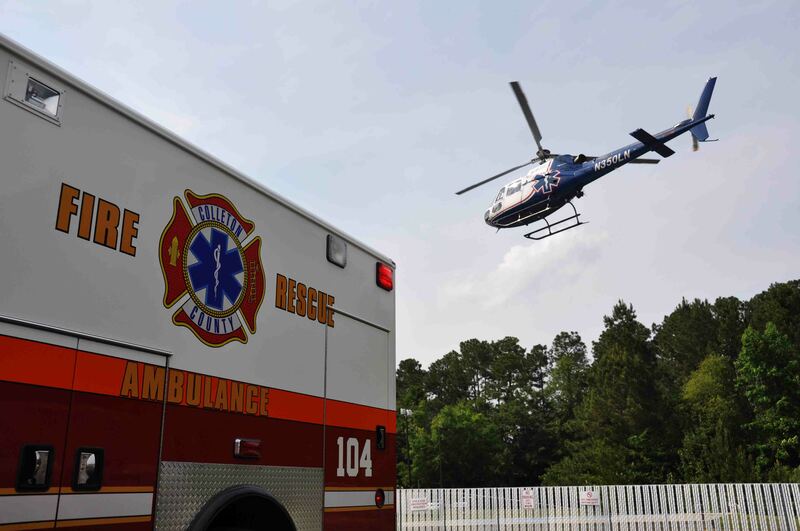 They made the official announcement that the company will be basing a medical helicopter on a full time basis in Colleton County beginning this summer. Many people have worked hard to make this a reality. Click here for additional information. 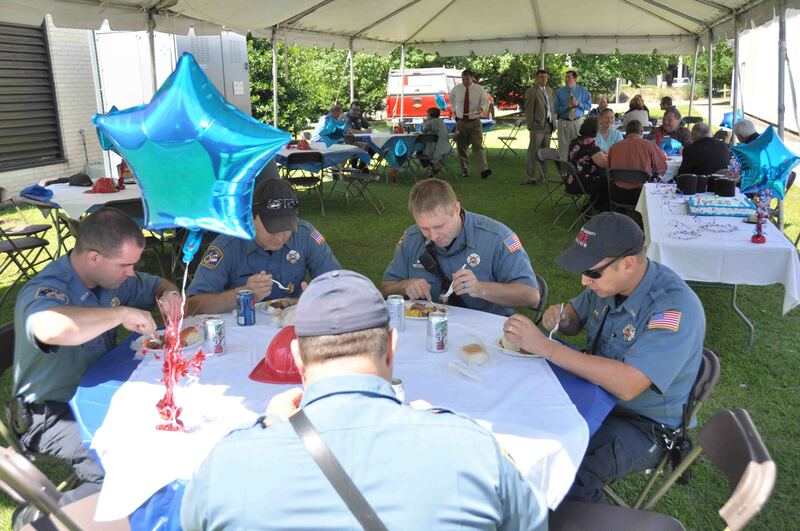 Colleton Medical Center sponsored a wonderful luncheon for Emergency Medical providers in conjunction with National EMS Week. Judy Christy (ED Director) coordinated the event which was held on the hospital grounds. The delicious meal was prepared by the Hospital’s Chef. Fire-Rescue, ED Staff members, Hospital Board Members, several Doctors, surrounding EMS providers and local private ambulance personnel attended. Click here for additional information. The SCFA catalog for July-December 2011 has been published. Click here to view the SCFA website or click here for more information on courses that CCFR is hosting. We express condolences to the family of Firefighter-EMT Kevin Baker. Kevin’s father-in-law, Roger Brownlee, passed away Sunday afternoon. The visitation will be held at Bryant Funeral Home in St. George, Tuesday night (17-May) from 18:00 to 20:00. The funeral will be held at 15:00, Wednesday (18-May) at Calvary Baptist Church on Highway 78 east of St. George in the Pregnall Community. Please remember the family in your prayers. Long-term Battle with Cancer Claims the Life of the South Carolina's Senior Fire Chaplain. It is with deep regret that we inform you that the Reverend Monsignor Joseph R. Roth, PA passed away Sunday morning, May 15th at 0915 hours. Click here for additional information. We have been notified by John Todaro of the Lowcountry Regional EMS Council, of the death of Dennis Skelton, who passed away last week. Mr. Skelton is a long time member of the Lowcountry Council and recently served as Chairman. A memorial service has been scheduled for Saturday, May 21, 2011 at 12:30 PM at the Indian Fields United Methodist Church, 2030 Highway 15 N, St. George, SC 29477. Click here for additional information. Lightning appears to have been the cause of a four alarm structure fire at 3396 Hendersonville Highway Friday night 13-May. Around 22:00 a neighbor reported hearing a loud boom, what sounded like lightning striking a tree. 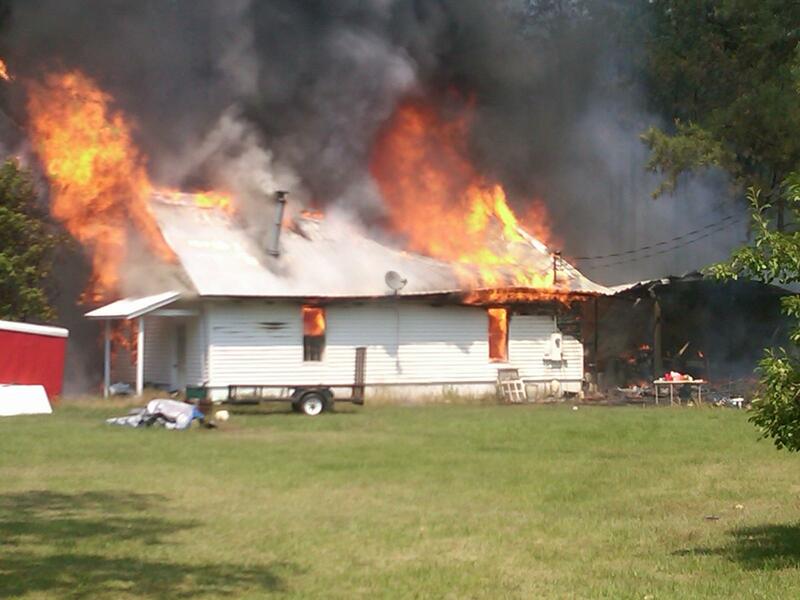 Several minutes later he discovered smoke and flames coming from the Great Swamp Baptist Church. Click here for additional information. Colleton County Firefighters participated in the annual Relay for Life event at the High School Track Friday evening 13-May. Fire Marshal Richard Sheffield coordinated Fire-Rescue’s participation which included multiple personnel. 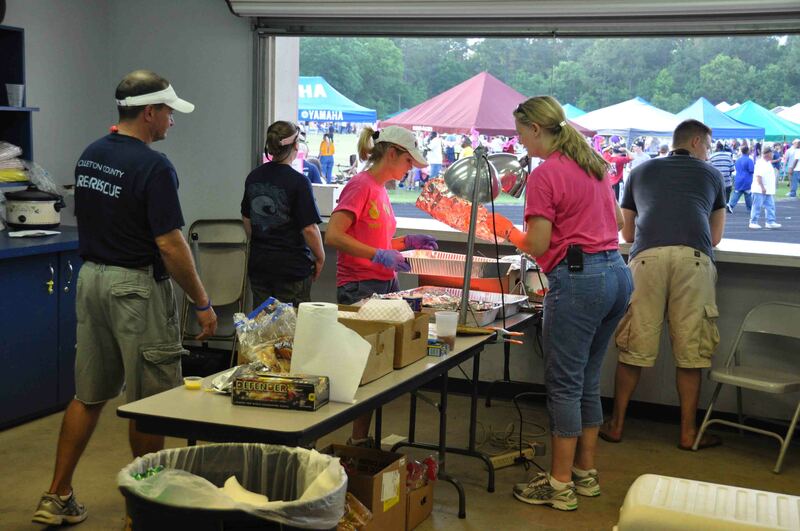 Firefighters and their families operated the concession stand for the participants. It involved weeks of food collections and donations, preparing food and they operated the dunking booth. Click here for more info. 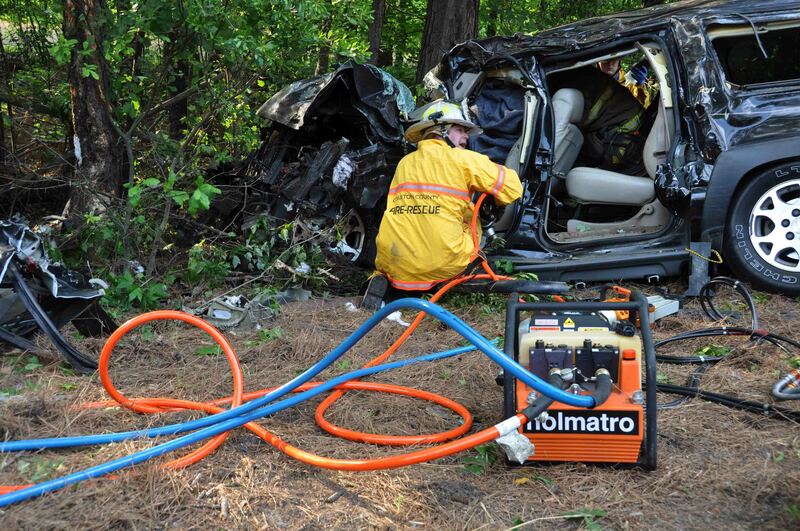 Two people were left in critical condition following a high speed MVC on I-95 near the 61 mile marker north bound, Friday afternoon 13-May at 3:20 PM. A northbound customized full-sized van that was pulling a trailer, left the roadway, over-turned and struck several trees. Both occupants were ejected from the van. Click here for additional information. 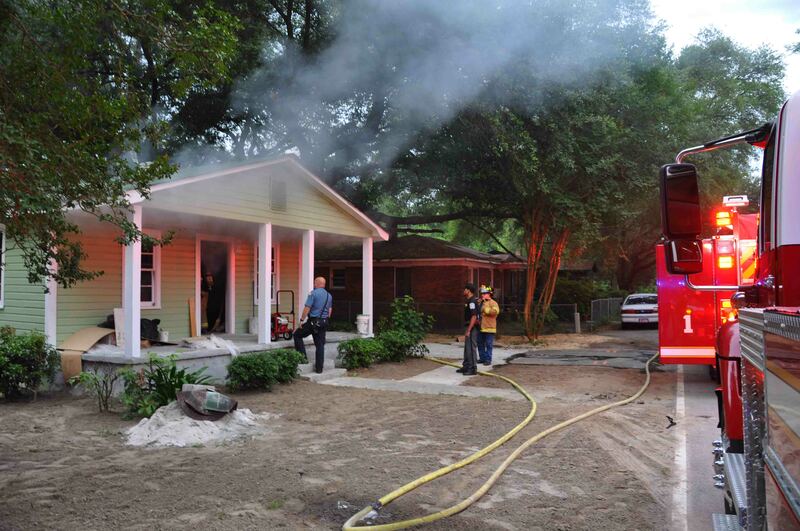 A suspicious fire is being investigated following a response to 448 Deloach Ave Wednesday morning 11-May, at 0624. Fire units were called to the scene after a passerby reported smoke coming from the residence. Engine 1 arrived to find light smoke showing from the front and rear of the structure. 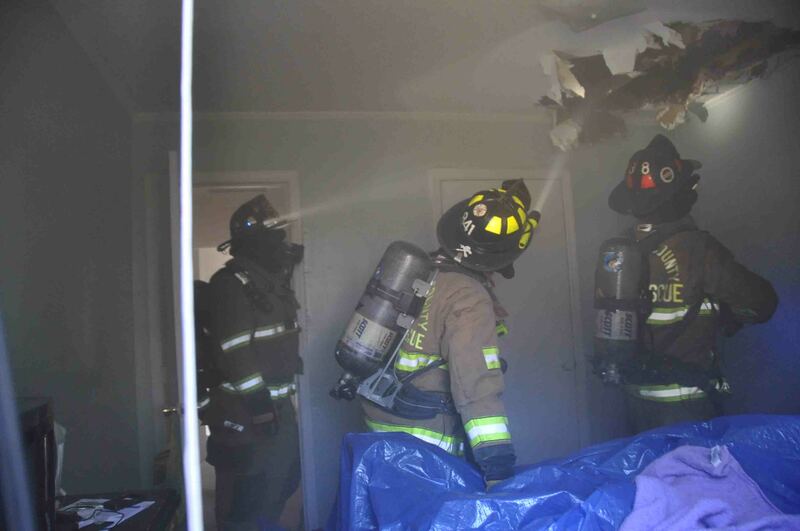 One 1-3/4 handline was deployed to enter the building....click here for more information. 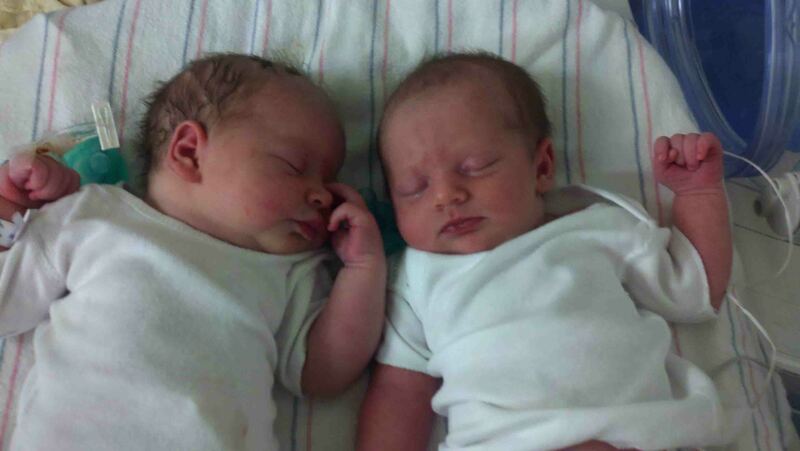 5/11/2011- We congratulate Lt. Jimmy Jacques and his wife Firefighter Ashley Jacques on the birth of twin daughters who were born Tuesday evening 10-May. Abbagale May Jacques was born at 15:17 and weighed in at 6 pounds 1 oz She is 19 3/4 in. long. Her sister, Brianna Rose Jacques was delivered at 15:58. She weighed 6 pounds 12 oz and was 20 inches long. Both babies and mom are healthy and doing well. The twins are their second and third daughters. Engine 31 made a quick knock down on a two car garage fire Tuesday night 10-May. Firefighters were sent to 14436 Lowcountry Highway at 21:36 for a report of several buildings on fire. Engine 31 arrived in less than 5 minutes to find a two car garage behind the residence well involved. Firefighters hit the fire with the deck gun and deployed one 1-3/4 handline. Click here for additional information. 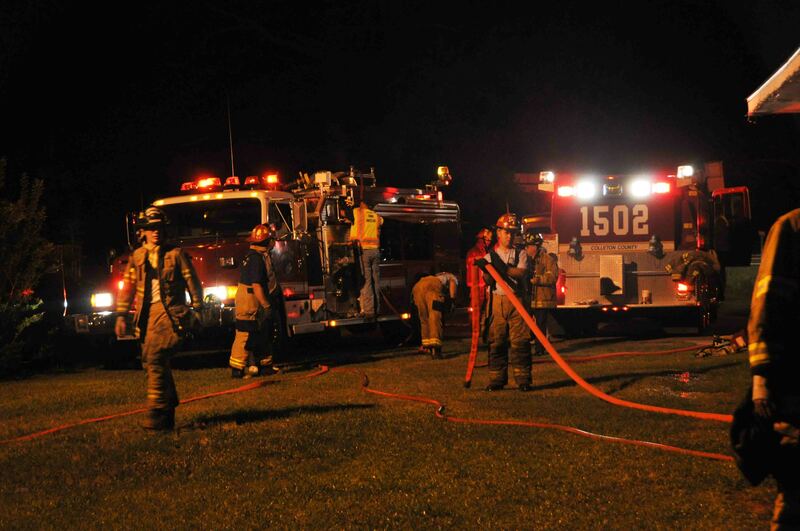 At 02:28, Tuesday morning 10-May, Fire-Rescue units were dispatched to a house fire located at 538 Fifth Street in the Foxfield Subdivision. Engine 19 arrived to find a singlewide mobile home approximately 80% involved. The roof in the center of the structure had already collapsed. Firefighters deployed two 1-3/4 handlines, making an exterior attack on the fire. Click here for additional information. A 35 year old Camden, SC man is in critical condition following a high speed MVC on I-95 at the 50 mile marker northbound. Sunday afternoon 08-May at 17:40, off-duty Firefighter-EMT Joseph Holmes rode up on the accident while the dust was still flying around the scene. The 2003 Chevrolet Suburban left the roadway after a curve, entered the median and struck several trees. Click here for additional information. A multi-vehicle MVC on the county line resulted in one fatality and sent four other people to a Trauma Center, three in critical condition. The accident occurred during a thunderstorm at 14:53, Friday afternoon 06-May. Three vehicles collided on the busy four lane highway. 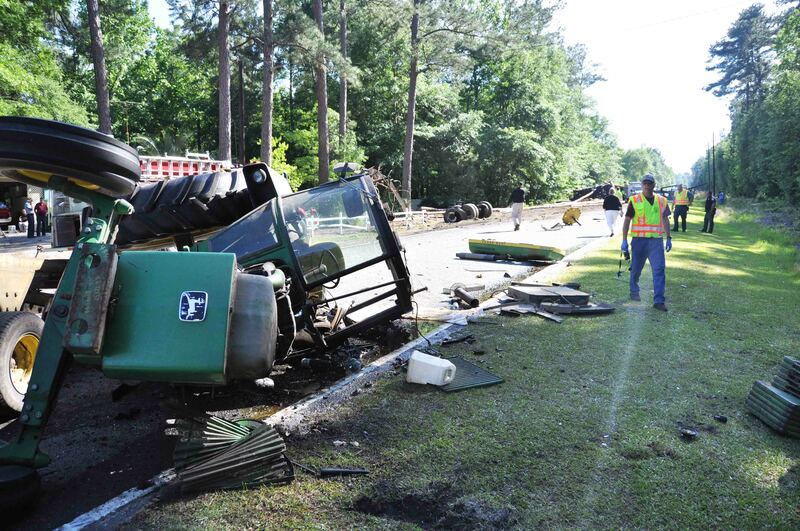 The accident was originally reported to be in Colleton County on ACE Basin Parkway (US Hwy 17) about 2 miles south of Jacksonboro. Click here for more information. 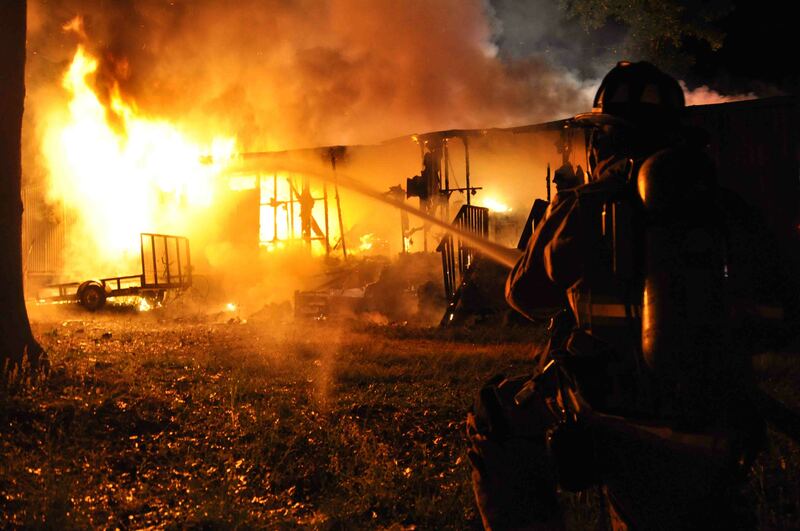 Stations 1, 12, 19 and 27 responded to a structure fire at 4464 Charleston Highway at 05:10, Friday morning 06-May. The homeowner noted he woke to see bright lights in his back yard. Upon investigating he discovered the large rear wooden deck on the house burning. He notified 9-1-1 and began fighting the fire himself with a garden hose. Click here for additional information. 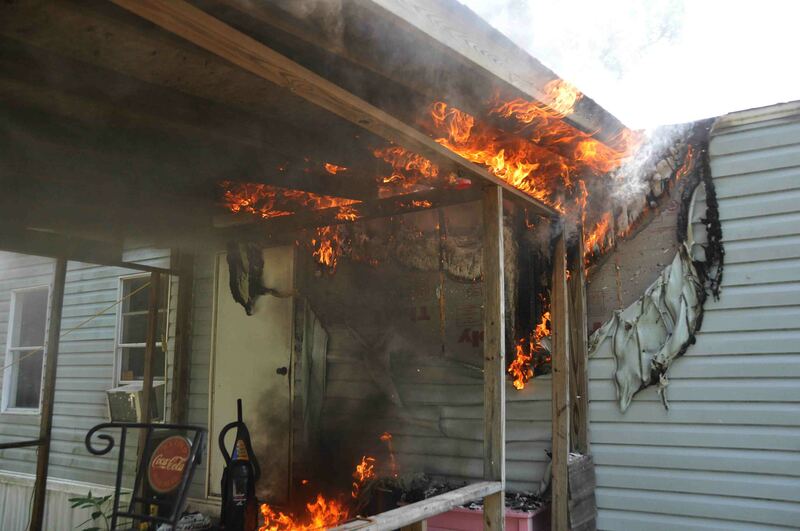 An afternoon house fire heavily damaged a Walterboro home at 16:47, Thursday 05-May. 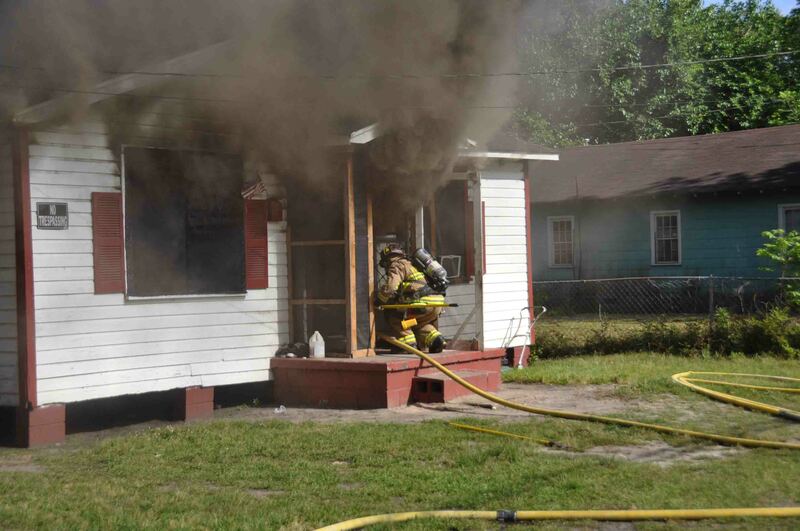 County Fire-Rescue units responded to a reported address of 501 Rivers Street at the intersection of Proctor Street for smoke coming from the residence. Engine 1 arrived to find the small single story wood frame structure with heavy smoke and flames visible. Click here for additional information. A two vehicle collision on Lodge Hwy (SC Hwy 217) has left one man with fatal injuries and closed the highway for six hours. The accident was reported at 15:20, Wednesday afternoon 05-May at the intersection with Sunflower Road west of the Town of Smoaks. Initial reports to 9-1-1 were confusing, reporting a car accident, one with reports of entrapment and another caller reporting a pedestrian hit by car. Click here for more information. 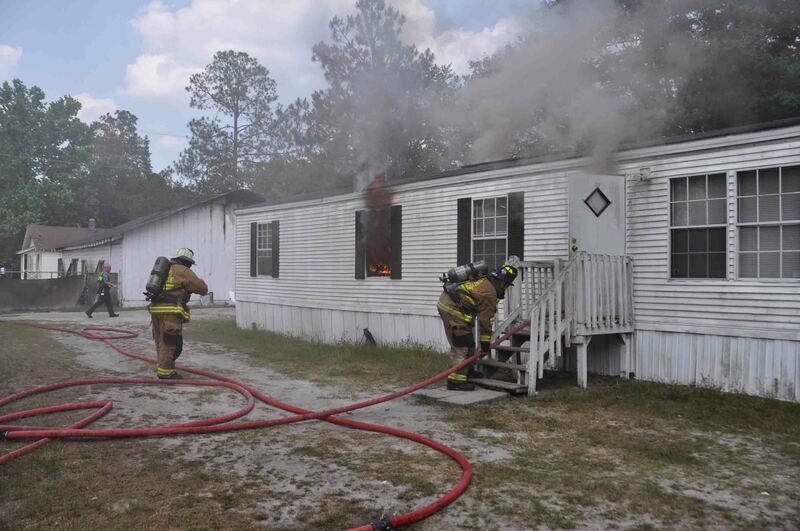 Engine 18 and Tender 23 responded as mutual for Hampton County Fire-Rescue on a structure fire located at 9082 Bamberg Highway (US Hwy 601) south of the Colleton County line. 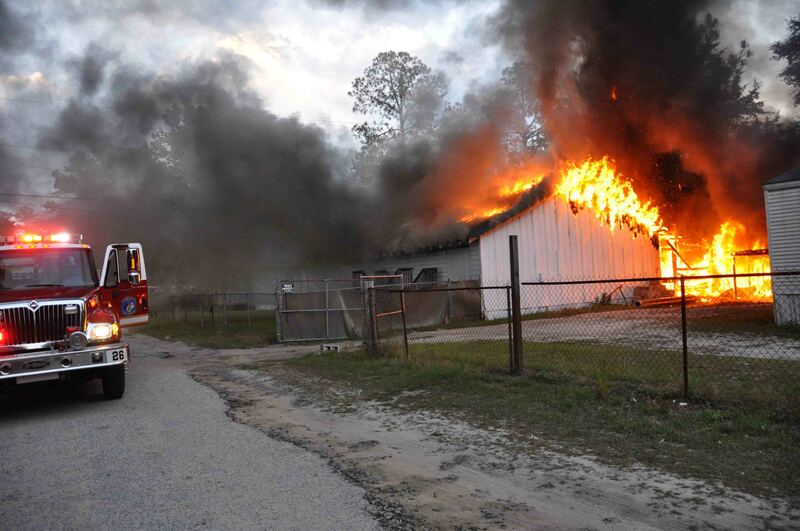 Hampton County units were called to the scene of a well involved commercial structure that was used to make pottery. Tender 23 shuttled water for the firefighting operation, while other personnel assisted Hampton County crews. Units were on the scene for several hours. Click here for additional information. Two Ritter families have been displaced following a mid afternoon house fire in a duplex located at 5670 Ritter Road. The fire was reported at 3:27 PM, Wednesday 4-May. Engine 6 and Engine 8 were on the scene of a woods fire in the 2200 block of Ritter Road when the incident was dispatched. Engine 8 was able to leave the woods fire to respond to the structure fire. Click here for additional information. 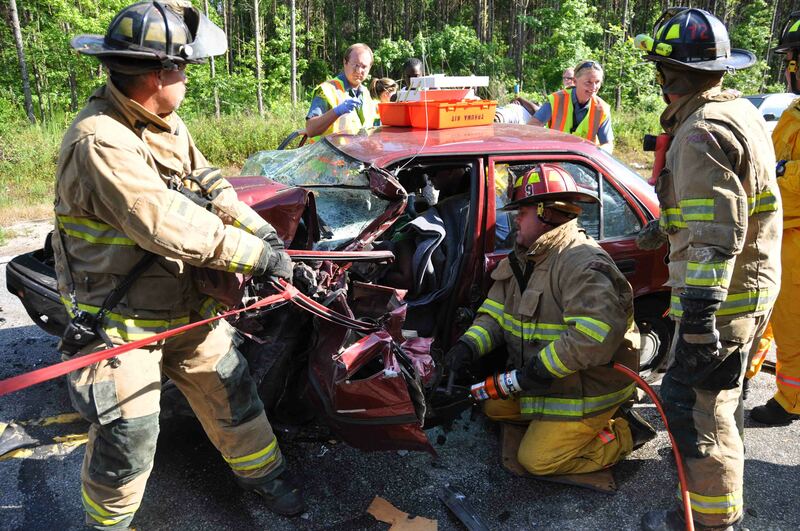 Three people were hospitalized following a single vehicle MVC on I-95 at the 51 mile marker northbound Monday afternoon 2-May at 14:19. A late model 4-door Dodge pickup truck left the roadway at a high rate of speed, struck several trees before it over-turned in the wooded median. 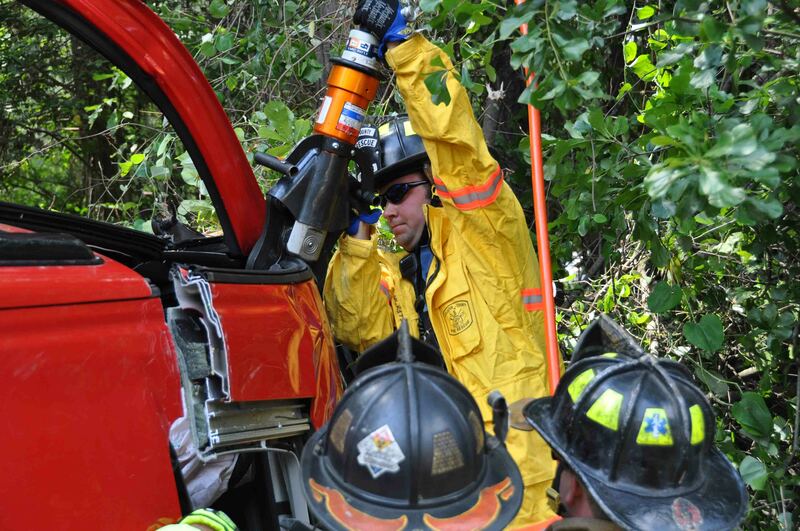 Three passengers were able to climb out of the truck, however an adult male was trapped in the wreckage. Click here for additional information. A yard debris fire burned out of control in light winds Sunday afternoon, damaging several pieces of personal property and destroying a storage building. Engine 19 arrived to find approximately one acre of woods/grass burned, a 10x10 metal storage building fully involved, as well has a utility trailer and riding lawn mower that was on fire. Click here for additional information.